Smart and fast enough? Here's a spiffy Freckleface Hawk pic in Indonesia, Komodo National Park by Rob Koffler! foot long Mac Angel, 10 inch French, also some medium sized Triggers, 5 year old 6 inch Clown (never took off size wise), Red Tooth, Indian, and Huma. Are Undulate a whole different level of evil? Or be just another fish in a system like this? I had read somewhere Red Sea varieties perhaps not as nasty? One of the most beautiful fish in the hobby, but I don’t want to risk upsetting the balance. <Adding anything live here is a risk; but I would not be daunted by this addition. Hello, this is Kim. I have a 125 gallon with a juv. Snowflake Eel (over a foot long, 1" diameter) and a Neon Velvet Damselfish (around 2-3"). My friend gave me a 3" Undulate Triggerfish. Would these fish get along? 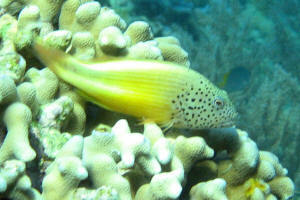 I'm expecting the Damselfish and Triggerfish to fight, however, I am hoping that the Triggerfish doesn't harm the eel. A lot of macroalgae and live rocks to hopefully create territory. Thank you. P.S. the Undulate Triggerfish is a female if that makes a difference. I don't know if it is from the Red Sea though. Males have a bald patch on top of their snout, while females have stripes throughout. However, thanks for the answer. It's a shame how aggressive these beautiful fish are. I was really hoping that I can at least keep it with the Snowflake Eel. Damselfish, however, was probably a stupid idea. I was hoping that the damsel would be scrappy and hold on it's own. Never thought a fish would pick on an eel though. You probably did a double take when you read the subject line of this email: Undulated Triggerfish and Coral Banded Shrimp? But that is what I have. My tank is 80 gallons and full of soft corals. My only inhabitant was intended to be an Undulated Triggerfish, but I received the Coral Banded Shrimp as a hitchhiker. I thought for sure the trigger would have eaten him, but it has been over a year and the fish shows him no interest whatsoever. The shrimp spends the most of the day hiding in the same hole but comes out to feed on occasion. The trigger can be right next to him and does not pay any attention at all. Isn't this somewhat unusual? The trigger is about 4" and the shrimp about 2". Thanks for any insight you might have, and thanks for all of the work providing this valuable and interesting service to the aquarist community! I have read over your site about undulate triggers. I have a 90 gallon aquarium at home. I plan to add 7 green chromis, a golden butterfly, a purple tang and an undulate triggerfish added in that order. All specimens from the red sea. Do I have enough room for my inhabitants to live a long enjoyable life? It would be a FOWLR set up. 100lbs of live rock and oversized skimmer with lots of flow in the tank. The fish are always my main concern.